New window openings in the North East elevation and situated on the first floor should be constructed so that no part of the framework less than 1.7m above finished floor level shall be openable and any part below that level should be fitted with obscure glazing. - the windows (just to make it a little more challenging still) are dormer windows, so not huge amounts of space and ceiling height to play with. Any ideas? Attached pic hopefully makes above a bit clearer. 1. you have other windows in this room from which you can get a view, so I would not be too concerned about this one having obscure glazing. 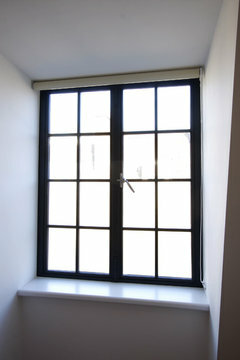 2. this window is for the study and/or occasional use as a guest room. Perhaps it's an advantage that someone working here would not be distracted by the view? 3. the staircase window has the opportunity to be a show-stopper with a stained glass design. Because the dimensions of this window will match the others, I don't see a problem with the glass being different here. 4. I'm assuming that you have regular glass in this last window? If you find you need more light in the study, do you have access to something like Solatubes where you can bring more daylight into the space through the roof? I would ask if they will accept a self adhesive privacy film applied to those specific windows. This is not only a cheap solution - it also gives you much more scope for choosing from a wide array of pattern's/styles alongside the exact placement for the frosting. Saves you money on getting specially frosted glass windows too. Finally it means if you change your mind on the style down the line its easy to swap out. There're also plenty of companies doing stained glass versions. Though personally I think visual continuity on the exterior of a house makes for much more curb appeal. So having just one stained glass window isn't something I'd go for but it's definitely a personal decision. 1. agreed ... although I would just raise the small concern that this will be a large master bedroom which we hope will be impressive and attractive on any future sale. Therefore we would like to avoid as far as possible, anything which makes one end of the room look a bit unusual (i.e. one obscured window not matching other clear windows). I am hoping we can come up with some internal (or possibly even external) design idea to mitigate the actual difference in window glass. One idea has been to use folding plantation shutters for example and to have the top 1/3 of windows (above the 1.7m threshold) as openable. However given the windows are dormer, the top 1/3 has the sloping roof, so cannot fit in plantation shutters around the top 1/3. 2. agreed again ... but again for future use by other occupants, it may seem strange to have a room with only obscured glass (or at least the main window pane up to 1.7m). Wondering if there are any design ideas which can make it look more like a normal room even though 3/4 of the window pane will be obscured. 3. that could be possible, I was thinking it would be a problem since the size matched (as usually I've seen the staircase window when stained glass being of a totally independent size and shape and therefore one does not even expect it to match, as it is unique in every way). However, here it is not only the same size and shape but also part of a horizontal row of windows, so I would think maybe the eye would expect matching styles across the plane? Would love to see a photo of exterior of a house where one of the windows in a row of similar sized windows is stained, if anyone can share? 4. The last window will continue to have regular glass as is it part of existing (pre-renovation) house and in any case (although difficult to see from drawing) set back from the 3 new windows by about 2m (you can see a flat roof in front of it). Therefore less of a need to imagine it would match as it is on a slightly different plane to the other three. 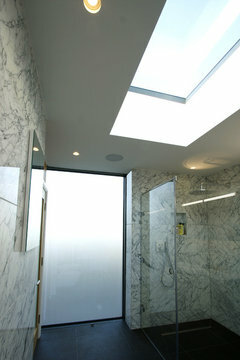 Will definitely consider Solatubes for the study room ... hoping this is not another planning authority approval issue! Thx whirlligig ... really great suggestions, especially on http://www.purlfrost.com/stained-glass-2/victorian-stained-glass/#.VeiWO_ZJbIU ... now it's whether they will accept this as they have actually written 'obscured glazing of a patterned type' ... I'm not sure exactly what types of glasses that means but a quick google search suggested patterned glass is the type which actually has a texture. Glad I could help and hopefully you can argue that so long as you don't pick an absolutely plain frosting then it could be described as 'patterned'. They may not go for it but its worth asking the question. Let us know how you get on and good luck with what looks to be a lovely project. Nobody will ever come to check it. Only an issue if your neighbours complain. It's a planning condition and building control only check you comply with building regulations not your planning permission. what about is you swap all three obscure glass windows for high up velux windows? We have a great range of frosted window film for privacy which you can look at as a solution. Would they accept opening windows if they were inward opening? I am assuming that the requirement for non-opening windows below 1.7m high is so that any opened windows do not restrict access down the side of the building. Most aluminium windows could be specified as inward opening to allow ventilation. The cleanest, most contemporary way to create obscure glazing is with a translucent finish to the glass. There is a fully structural glass high level window with this type of glass at our showroom in Amersham if you wanted to see some in person. You could try "stained glass windows" but use different textures of glass rather than coloured glass to create the pattern. This is a more expensive and permanent option than the films or a single sheet of obscure glass, but can be very beautiful. It's unusual for the planning condition not to state the privacy rating that the glass needs to comply with. It isn't typical for "textured glass" to be specified rather than something like "privacy rating 3". It might be a good idea to check this with the planning officer who dealt with your application as the privacy rating will affect which patterns you can use. For example Pilkingtons glass has a range of different textures/patterns and is clear about what the privacy ratings are for each. The max cill height for an 'escape window' is 1100mm. So wouldn't the planning conditions contravene building regs in the spare room? I think there needs to be one means of escape in each first floor room? Not sure if it applies to renovations/ extensions but it did apply to our new build plans. POLL: Yay or nay - open plan kitchens?